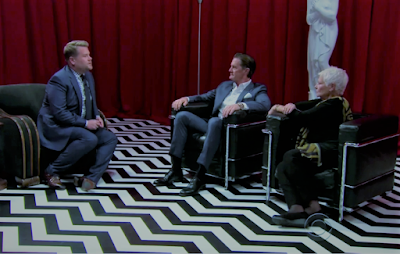 Blue Rose Epics | Entertainment: Kyle MacLachlan Guides Judi Dench and James Corden in the Red Room & More! Kyle MacLachlan Guides Judi Dench and James Corden in the Red Room & More! Not to be outdone by Late Night with Seth Meyers, last night James Corden made his own Red Room sketch on The Late Late Show and with Agent Cooper himself, the talented Kyle MacLachlan. The Dame Judi Dench joins in on the fun and surprisingly Kyle and her share amazing comedic chemistry. I hope they do a feature film together in the near future. The world needs more of this hilarity! The full interviews with Judi Dench and Kyle MacLachlan are worth watching, but here is an amusing clip of Kyle explaining his love scene with Naomi Watts as the innocent Dougie. Turns out, the arm flailing was a happy accident the Director of Photography commented on and Kyle accentuated for greater comedic effect. My recommendation, someone out there, write a buddy cop movie with Kyle MacLachlan being partnered up with Judi Dench on a case. Is it just me, or do you want to see these two investigate a series of crimes in a comedy?